The organisers of the protests that drove Sudan’s President Omar al-Bashir from power are delaying their announcement of a transitional civilian government as they hold new negotiations with the ruling military council. The organisers of the protests that drove Sudan’s President Omar al-Bashir from power are delaying their announcement of a transitional civilian government as they hold new negotiations with the ruling military council. The protesters suspended talks with the military last weekend, saying key figures in the council were too close to Mr al-Bashir. The Sudanese Professionals Association, which spearheaded the protests, had planned to announce a transitional civilian government at a mass rally on Thursday. But Ahmed Rabie, a senior member of the group, says it will delay the announcement and instead focus on forming different committees to hold talks with the military. Locals in a rural County Tipperary town have expressed their shock after a Ladbrokes bookmakers was broken into overnight. Three men stole a safe from the premises in The Square in Fethard at around 1:30 this morning. CEO of Tipperary Chamber, David Shanahan, said incidents like this worry small communities. "Fethard is a small town and these kinds of things don't happen around here that often. "People will be looking at their own security and reviewing their own security as they learn more about the robbery and what exactly happened." Microsoft's value topped $1 trillion (£776,300m) for the first time ever and it now sits as the world's most valuable tech firm. Scroll down for videoMicrosoft's value topped $1 trillion for the first time ever and sits atop the tech world again. In the three months leading to the end of March, the computing giant saw a boost in revenue, operating income and net profit compared with the same period last year. 'Leading organisations of every size in every industry trust the Microsoft cloud,' said Microsoft chief executive Satya Nadella. 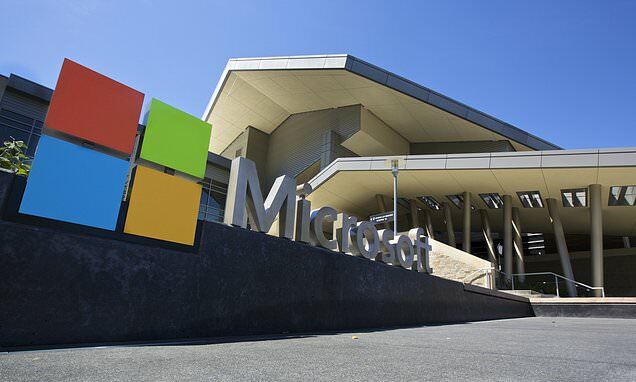 Under Chief Executive Satya Nadella, the company has spent the past five years shifting from reliance on its once-dominant Windows operating system to selling cloud-based services. Weather forecasters have warned of gusts of up to 80mph (130km/h) and low temperatures “more like January” this weekend, with Storm Hannah expected to hit Ireland . The UK Met Office said on Thursday that its Irish partner had chosen to name the storm, which is expected to bring strong gales to Ireland on Friday night. Forecasters are predicting “very disturbed and unsettled” weather conditions, with the potential for stormy conditions in the south west of Ireland on Friday. On Thursday, a status yellow wind warning was issued for Connacht, Carlow, Kildare, Kilkenny, Laois, Longford, Wexford, Wicklow, Offaly, Donegal, Tipperary and Waterford, running from 11pm on Friday to 9am on Saturday. More weather warnings associated with the storm are expected to follow later this morning. AdvertisementThe Duke of Sussex sat with the Duchess of Cambridge at Westminster Abbey today as he made a surprise appearance at an Anzac Day service to honour the sacrifices of Australian and New Zealand forces. His brother Prince William is in New Zealand paying tribute at a service in Auckland to those who lost their lives in battle. He shared a joke with members of the Chapter of Westminster, the ecclesiastical governing body of Westminster Abbey, as he was introduced to them by the Dean before the service. Earlier, a royal source told the Daily Mail of Harry: 'The duke is pleased he can attend today's service, as planned. Anzac Day – April 25 – marks the anniversary of the start of the First World War Gallipoli landings, and is a national day of remembrance for Australia and New Zealand. The final candidates for Northern Ireland’s three seats in the European Parliament are set to nominate themselves later. SDLP leader Colum Eastwood and TUV leader Jim Allister are also expected to submit their nominations today. However, elections to the European Parliament are proceeding after London and European Council agreed to delay Brexit. Northern Ireland’s three seats in Brussels have historically been divided between the DUP, Sinn Féin and the Ulster Unionists. The candidates running for Northern Ireland’s three seats in the European Parliament are Sinn Féin’s Martina Anderson, the DUP’s Diane Dodds, Danny Kennedy (Ulster Unionist Party), Colum Eastwood (SDLP), Naomi Long (Alliance) and Jim Allister (TUV). There are 503 patients waiting on trolleys in hospitals across the country this morning. According to the INMO, the worst affected hospital is University Hospital Limerick with 60 people waiting for beds. This is followed by 39 at Cork University Hospital and 39 at Tallaght University Hospital. One person under the age of 16 is also waiting for a bed. Previous figures for trolley numbers, provided by the INMO can be found here. Sri Lanka’s former navy chief says the father of two of the Easter suicide bombers has been arrested on suspicion of aiding his sons. Sri Lanka’s former navy chief says the father of two of the Easter suicide bombers has been arrested on suspicion of aiding his sons. Jayanath Colombage, who now is a counter-terrorism expert at the Pathfinder Foundation, confirmed the arrest to reporters. Sunday’s co-ordinated suicide bombings targeted three churches and three hotels, killing at least 359 people and wounding 500 more. The group was previously only known for vandalising Buddhist statues and for the extremist online sermons of its leader, alternately named Mohammed Zahran or Zahran Hashmi. The number of measles cases in Ireland has increased more than three-fold, according to a United Nations (UN) report that warns millions of children worldwide are missing out on the measles vaccine. In Ireland, the number of cases have risen by 244 per cent, increasing from 25 cases in 2017 to 86 cases in 2018. In 2017, some 110,000 people, most of them children, died from measles - up 22 per cent from the year before, Unicef said. Two doses of the measles vaccine are essential to protect children and the WHO says 95 per cent vaccine coverage is needed for “herd immunity” against measles. Nigeria in 2017, for example, had the highest number of children under one-year-old who missed out on the first dose, at nearly four million. MET Éireann has warned that there may be power outages on Friday as Storm Hannah moves in over Ireland. MET Éireann has warned that there may be power outages on Friday as Storm Hannah moves in over Ireland. A Status Orange wind warning has been issued for Clare, Cork, Kerry and Limerick from 4pm on Friday until 5am on Saturday. "In the evening it will become very windy or stormy in west and south Munster, with very strong, gusty west to northwest winds," Met Éireann said. The UK Met Office has also issued a Status Yellow wind warning, with the remnants of the storm expected to cross parts of south Wales and south England overnight on Friday. BT plans to exit the Irish market though the £400m (€462m) sale of BT Ireland. BT plans to exit the Irish market though the £400m (€462m) sale of BT Ireland. BT Ireland services corporate clients across the country. The British multinational has reportedly invited bids for BT Ireland as part of a purging of its Global Services international arm. BT Ireland, which operates in five cities across the country, is synonymous with the Young Scientist & Technology Exhibition, an annual event it has been involved in for 17 years. Doctors who are fighting to save the lives of Ebola sufferers amid the ongoing outbreak in the Democratic Republic of Congo (DRC) have threatened to strike. Medics have warned they will walk out indefinitely as early as next week if health workers continue to be attacked in the African nation. 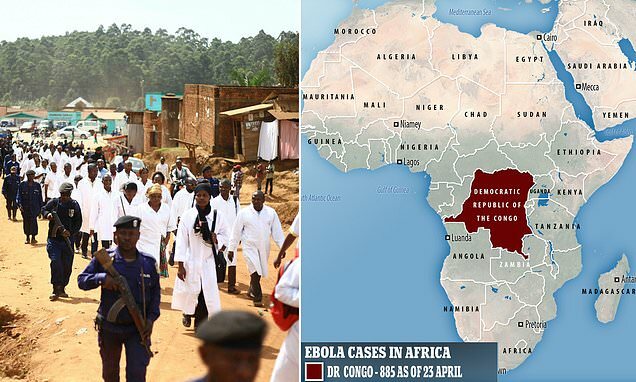 Armed militiamen reportedly believe Ebola is a conspiracy against them and have repeatedly attacked health workers who are trying to fight the DRC's second deadliest outbreak of the killer virus ever. Mr Kanyamanda has said he understands why health workers are frustrated and the Government will respond to their demands. Many distrust the Government's efforts to contain Ebola and falsely believe foreigners have brought the virus to the area. 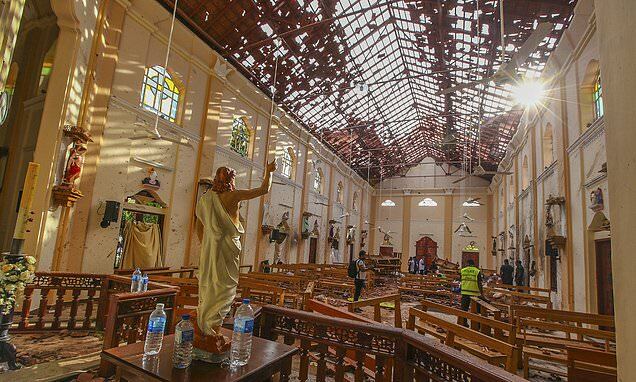 Sri Lanka's Catholic churches have suspended all public services over security fears, as several suspects remain unaccounted for over the Easter terror attacks. 'On the advice of the security forces we are keeping all churches closed,' a senior Catholic priest said. Private services for burials will still be carried out, but no public masses are scheduled until further notice. Overnight, security forces using newly granted powers under the country's state of emergency arrested 16 more suspects in connection with the attacks. Authorities have said they cannot rule out further attacks while suspects remain at large. A local councillor has said the community of Tallaght in South Dublin is in fear these Easter holidays after shots were fired at a house overnight. At around 2am this morning a number of shots were fired at the front of a house in Cushlawn Park. He said: "People are trying to go about their lives in a normal way...it's school holiday time. "Cushlawn is a great community and people...are very upset about this as they are when any such incident takes place. "I would ask the community to cooperate with the Tallaght gardaí in respect of the matter."